Five Guys Burgers and Fries is ready to open Friday in the Kings Crossing shopping center. Add another burger joint to Fairfield's menu of dining options. The popular restaurant chain Five Guys Burgers and Fries opens today (Friday, Dec. 16) in the new Kings Crossing shopping center at Grasmere Avenue and Kings Highway East. On Thursday, employees were in the restaurant getting final training before the opening. A problem with town parking regulations this year almost cooked the zoning application to open Five Guys. The Town Plan and Zoning Commission initially ruled there were not enough parking spaces at the shopping center set aside for the burger chain. William Fitzpatrick, the Kings Crossing lawyer, argued that because of a driveway the shopping center shares with Home Depot next door, the center should get credit for those spaces. In the end, Fitzpatrick went to the Zoning Board of Appeals and received a waiver for the 13 parking spaces because the peak times for other tenants at Kings Crossing -- anchored by a Whole Foods Market -- are different from those at Five Guys. With the waiver in hand, the burger business was able to secure the TPZ approval. The Five Guys' menu, in addition to burgers, includes hot dogs, veggie or grilled cheese sandwiches and fresh-cut fries cooked in peanut oil. There are more than 900 Five Guys outlets in 46 states, and the Marona family, Nick, Bob, Dana and Mariann, has the rights to the Five Guys franchise in Fairfield County. Other nearby Five Guys restaurants include Westport, Norwalk, Newtown and Brookfield. 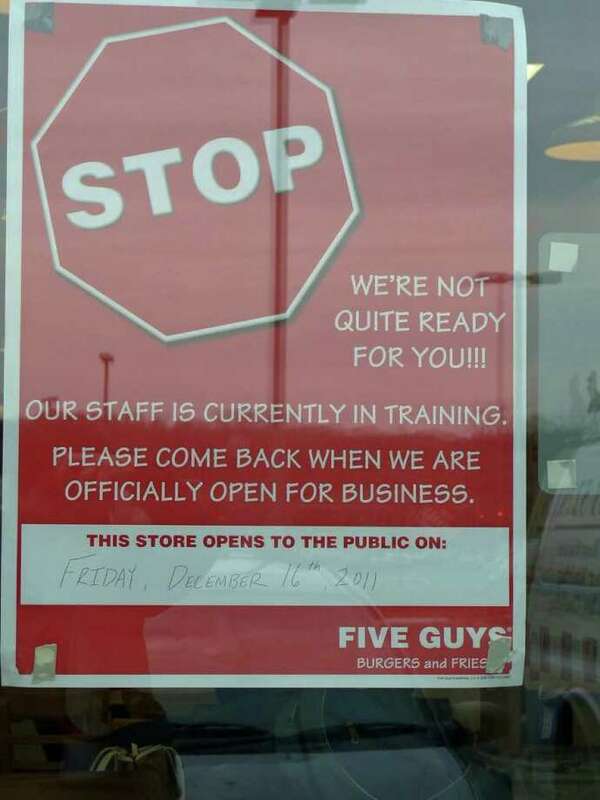 The Fairfield Five Guys will be open seven days a week from 11 a.m. to 10 p.m.
With the opening, nearly all the tenant slots in Kings Crossing are filled. In addition to Whole Foods, the center is also home to CVS, Chipotle Grill, PETCO and a Chase Bank branch. There is one empty retail space left.